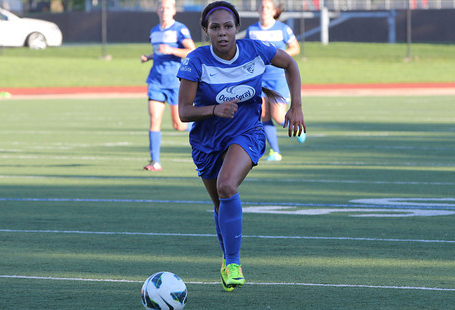 Sydney Leroux scored the lone goal of the game to close out the Boston Breakers’ home portion of the schedule on a winning note in Saturday’s 1-0 victory over FC Kansas City at Dilboy Stadium. Leroux’s strike arrived in the 65th minute, while Alyssa Naeher kept the sheet clean to notch her second shutout of the season. The win snapped the Blues’ 10-game unbeaten run and also extended the Breakers unbeaten streak to four. The Breakers record went to 8-7-6 (30 points), while Kansas City’s mark fell to 11-5-5 (38 points). After a scoreless first half, Leroux, the club’s leading scorer, tallied for the 11th time this season when he converted a Kyah Simon pass out of the reach of Kansas City keeper Nicole Barnhart minutes after the hour. Naeher stopped shots from Boston College alum Kristie Mewis and Erika Tymrak to preserve the win. The Breakers will close out the campaign on August 17 at Sahlen’s Stadium against the Western New York Flash in Rocheseter. Kickoff is set for 8pm.